I wanted to include a doorway in my composition if possible, which should be possible with the amount of doors in my house. 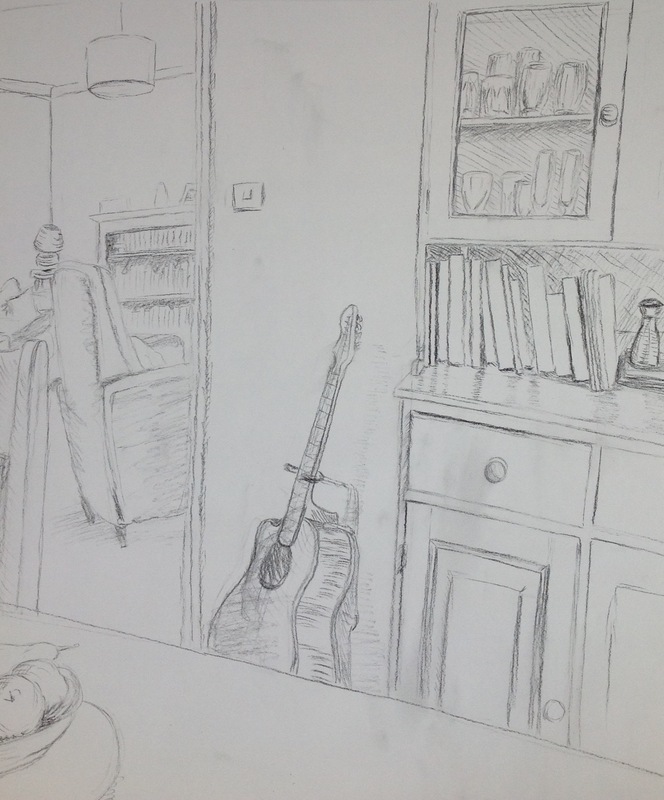 I also found myself drawn to dark areas of negative space in the previous exercises. So I tried to include bookcases, wine rack and cupboards to investigate these areas further. It was an interesting exercise trying to work out what works best. I really like the landscape composition below, in that the sketch is cropped close, filling the page so that little wall space can be seen. Maybe too much of the sketch is table top. 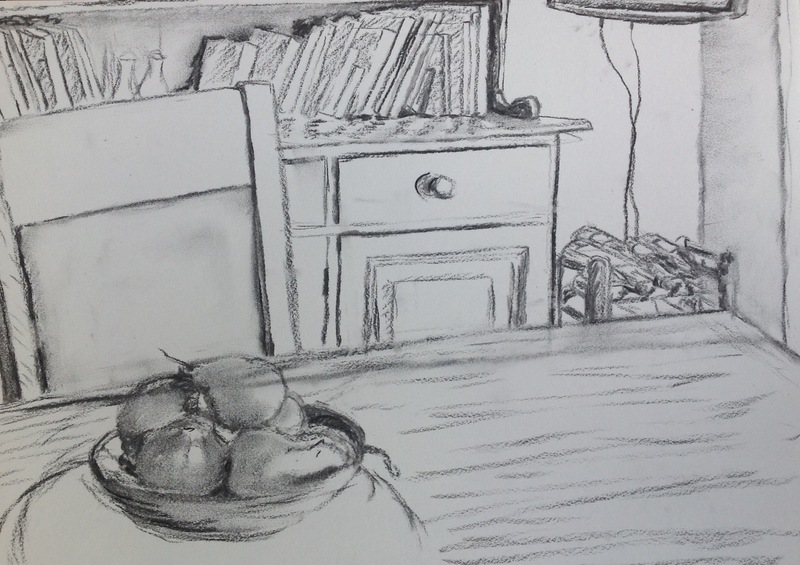 I liked having the fruit bowl in the foreground and the fruit and porcelain bowl will add different forms and textures to the composition, along with the wine bottles. Potentially , if it is a sunny day there should be some interesting shadows and reflections from the large window to the left. In the second landscape I have scanned back and turned to the left of the room. I like this composition with the horizontal and vertical planes, although again it would be better with less table. 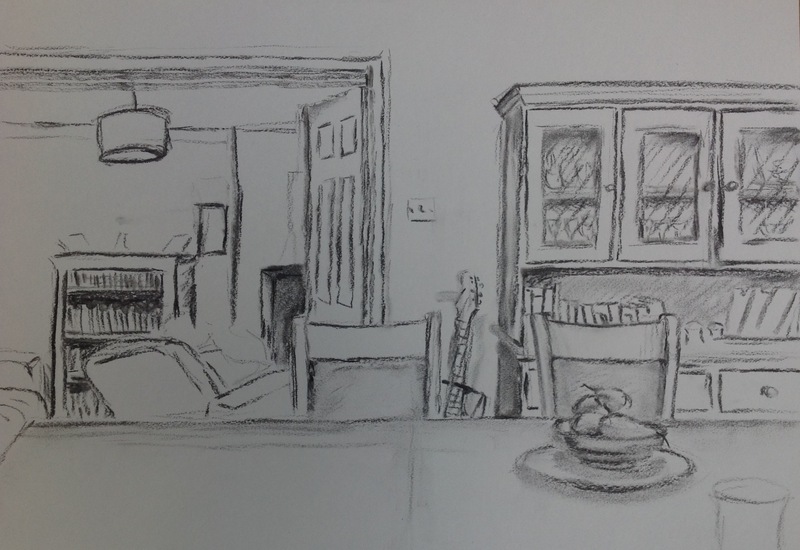 The doorway into another room adds interest and but gives a less intimate feel to the sketch. The next portrait sketch I tried out A2 paper which I find difficult to work with. This time the table runs diagonally across the bottom of the page with the fruit bowl and chair harshly cropped. The dresser and doorway loom up at the viewer. I find it an uncomfortable composition with too much negative space. I like the potential for reflections and shadows on the polished dresser surface. The fourth sketch is in portrait and drawn on A4. I have chosen to focus in on a corner to the right of the dresser and include part of the window. 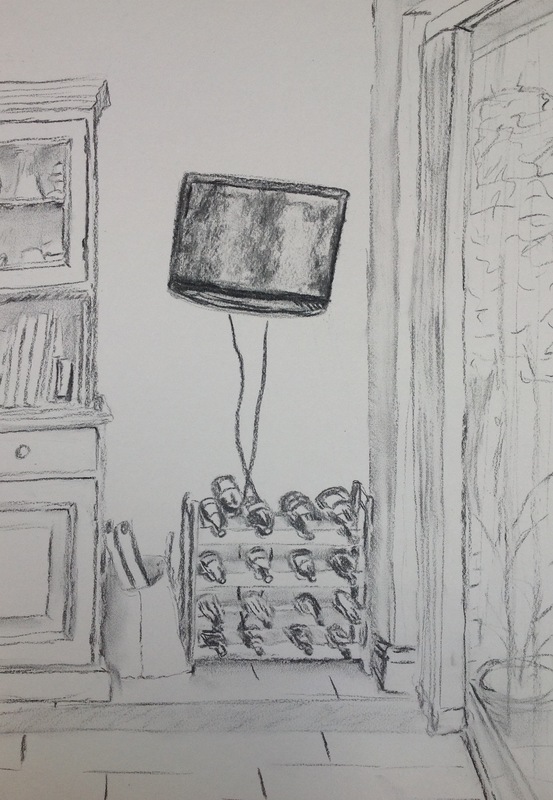 This could be a good composition if there was something other than a T.V. hanging centrally , on the wall which looks at odds with the rest of the composition.